Thousands of gardeners from Valley East work extremely hard during the short summer months bringing life to their yards. When you have a chance to visit these backyard wonderlands you are truly amazed at the creativity and beautiful landscape designs that have been created by your friends and neighbors. These are not magazine layouts. They are real, live gardens, existing right here in our own community. to be one of the most comprehensive Pond & Garden sites in Northeastern Ontario. The Valley East Online Pond & Garden Tour is expected to be very popular with local gardeners who love to work in the yard developing their own ponds and flower displays. They just never seem to have enough time to visit other yards to share ideas and see what other people have been able to do with their own creativity and hard work. 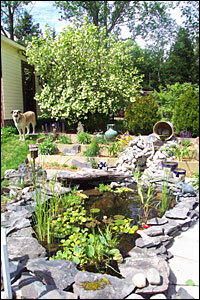 Our goal is to assemble a collection of 4 or 5 photos of ponds and gardens from as many homes in Valley East as possible. There are many residents who would love to see the work that others have done in order to get ideas to try out in their own yard. Whether you have only had time to develop one small corner of your own yard, or if you have dozens of special centers, please consider allowing us to come over and take some photos so that we can post them on the tour. If you would like to have your garden included on this site, please send some photos and include a write-up to give us some background about your garden.